A private company in China is deploying medical vans to rural areas to perform exams and to test urine and blood, but it’s not a benevolent government project. Private healthcare company WeDoctor (part of technology giant Tencent) offers the service so it can collect enormous amounts of patient data that it uses to train its AI-powered diagnostic engine. Participation isn’t optional since the government requires villagers to submit to examination. They don’t necessarily know that a private company is involved. WeDoctor, whose valuation is several billion dollars, operates online hospitals, sells data to drug companies, and offers appointment scheduling and video visits. It is connected to 2,700 hospitals, 220,000 doctors, 15,000 pharmacies, and 27 million active users. The founder saw an opportunity to disrupt a clogged medical system in which patients wait in line for hours just to schedule an appointment or resort to buying timeslots from scalpers. WeDoctor says it has the healthcare information of 180 million people, and while China has no laws that protect personal information, the company says it uses only de-identified patient data for its AI work. China is gaining an edge in healthcare AI because government control allows collecting and using patient data in ways that would not be legal in most countries. From Unilateral Disarmament: “Re: Cerner. The financial community is expressing amazement that Cerner paid so much attention to Starboard Value given the hedge fund’s low percentage ownership.” Quite a few experts are shocked that Cerner gave the Starboard Value hedge fund two seats on its board when it holds barely more than 1% of CERN shares. As one analyst said, 1% doesn’t give you much power to force change – just sell your shares if you don’t like the company’s operation, adding that two board seats usually comes only with a 5-10% position. Cerner rationalizes by saying it approved the new board members and they are well qualified (which they are), but the company did indeed capitulate quickly. They may regret that later now that they’ve invited a hedge fund into their house. Cerner also made it clear that they intentionally replaced visionary co-founder Neal Patterson (who, when healthy, would have told Starboard where to stick their ideas) with an “operator” in Brent Shafer, which sounds like a message that resonates better with a hedge fund than customers. He is an untested CEO and the whole “operational model” thing he keeps talking about sounds like something dreamed up by accountants rather than leaders, which if you are pandering to Wall Street, is probably the right thing to do. Maybe I’m just bitter in missing the competitive healthcare passion among pre-operator founders Neal, Judy, and Jonathan Bush. From Dudevorce: “Re: Inova Genomics. FDA warned them about illegally marketing their tests and predicting response to medications. Their MediMap web pages went down shortly afterward. Oncologist Donald “Skip” Trump, MD was hired by Inova to develop a cancer genomics program as the Inova Schar Cancer Institute. 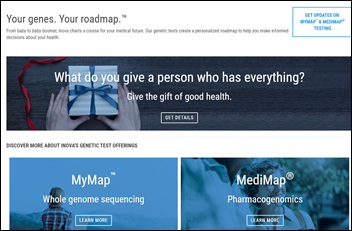 He recently disappeared from the Inova websites.” FDA issued a warning letter to Inova Genomics Laboratory on April 4, saying that its MediMap genetic tests for predicting medication response has not earned FDA’s marketing approval, also noting that the tests were being ordered by lab doctors with the results sent directly to patients without involving their own doctor. Links to the MediMap web pages now forward to Inova’s main site (I took the screen grab above from a cached copy). That other Donald Trump no longer appears under Inova’s “find a doctor” page. 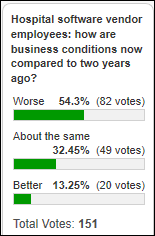 Most vendor poll respondents have seen business conditions slip in the past couple of years, whether than means reduced sales activity, provider consolidation that leads to bigger but rarer deals, or longer sales cycles. New poll to your right or here: How much time do you spend each week reading healthcare and health IT news, online or in print, excluding social media but including peer-reviewed journals? The Detroit business paper profiles Detroit Medical Informatics, an EHR consulting firm started in 2015 by Hass Saad, MD. He says the company is generating $4-6 million in annual revenue, has four full-time employees, and works with 300 physician consultants in serving 20 clients. A Stat editorial compares the proposed information-sharing rules of ONC/HHS to the Protestant Reformation, where information previously accessible only to priests was made available to everyone via the newly invented printing press, but notes that the final rule could be diluted through the influence of the AHA and lobbyists who are not fans of losing Medicare money when caught hoarding patient information out of competitive spite. It’s interesting when member organizations change their names or membership criteria to spur growth outside their original mission, such as CHIME when it weakened its membership criteria to include non-CIOs. The latest is AONE (American Organization of Nursing Executives), which in realizing that the “executives” part of its name limits its membership count, has thus decided to rename itself American Organization for Nursing Leadership. The doors have been flung open to dues-payers who are “not just defined by your title, but above all by your actions.” Someone should do a study on how much hospitals spend on dues and conference attendance whose value is primarily driven by vanity. Humboldt General Hospital (NV) will replace Medhost with Cerner in November 2019. Kingman Regional Medical Center (AZ) will implement Meditech this spring, replacing Cerner. Van Wert Health (OH) switched from Cerner to Epic in June 2018. Imprivata’s core Epic user switch functionality continues to work as intended with or without the Windows API. Instead, the feature that was affected by the API deprecation was a failsafe mechanism and not core functionality. For this to be seen at a customer site, a series of unfortunate events would need to occur, and we would define it as more of an edge case. However, due to the potential it has on our customer’s clinical workflows, we felt it important enough to notify our base as soon as we discovered it. Kudos to our QE team for finding this during our qualifications! Researchers find that cancer surgery outcomes are poorer in affiliates of top-ranked cancer hospitals that share their name. The authors conclude that hanging the big-brand cancer center’s name on the affiliate makes patients think they will receive care as good as that delivered by the mother ship, but that doesn’t actually happen. To me, the fact that a cancer hospital is a desirable brand is a troubling in itself – having worked for a hospital that affiliated with one of the big names, we talked a lot about sharing protocols and tapping the Big Cancer Center’s expertise, but I’m not sure it really made a positive difference. The health system eventually dumped the affiliation for that of another Big Cancer Hospital, which should have raised all kinds of questions about the before-and-after advantages, the cost to rent the big name, and whether patient outcomes changed as a result. Netsmart will exhibit at the NHPCO Leadership and Advocacy Conference April 15-17 in Washington, DC. Surescripts will exhibit at the 2019 OCHIN Learning Forum April 16-18 in Portland. Vocera will exhibit at the 2019 Argentum Senior Living Executive Conference & Expo April 15 in San Antonio. Wolters Kluwer Health CEO Diana Nole discusses areas where AI will impact future patient care.